A huge thanks to the again to the town’s Lorry Watch Volunteers! A driver was convicted of infringing the Bradford-on-Avon Town Bridge weight limit. He was fined £293.00, ordered to pay a victim surcharge of £30.00 and costs of £200.00. The offence took place on 30th April 2018. A company, M&G Haulage were also convicted of infringing the Bradford-on-Avon Town Bridge weight limit and ordered to pay a fine of £1,000.00, victim surcharge of £100.00 and costs of £200.00. This related to an infringement that took place on 25th April 2018. 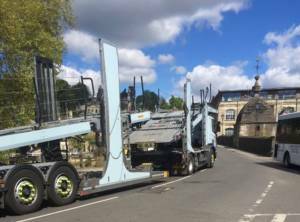 Bradford on Avon Lorry Watch is a joint venture between local councils and community volunteers, which aims to stop and discourage overweight lorries using the historic Town Bridge in contravention of the 18 tonne weight limit.